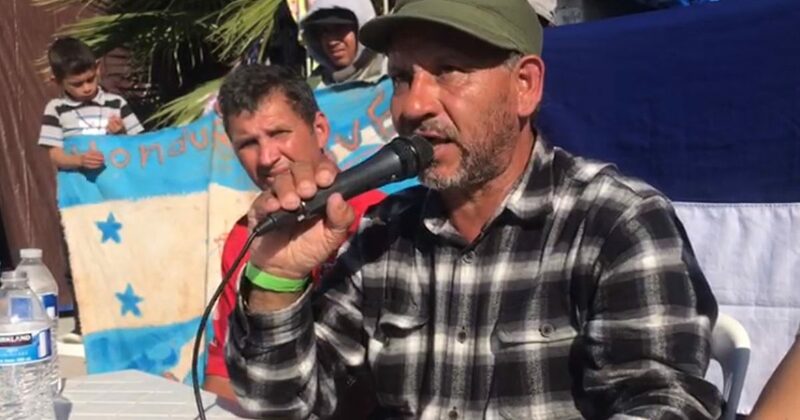 Alfonso Guerrero Ulloa is the de facto leader of a group of stubborn migrants who are either stuck in Tijuana since the caravan scattered, some to parts known, some to parts unknown, or are determined to make it across the border into the US. As we reported earlier today, it is suspected that as many as 3,500 migrants have successfully crossed the US border and are now somewhere in the United States. Ulloa, who, judging by his dress, suffers from a Fidel Castro fixation and refers to himself as “Comandante,” has been living in Mexico since 1987, where he was granted asylum after being accused of a terrorist attack that wounded six American soldiers and an American contractor in his home country of Honduras. With a well-known and burning hatred for the United States, leftist Ulloa led a group of 100 migrants to the US Consulate in Tijuana last week to demand entry into the United States or payment of $50,000 to each migrant to return to their native countries. I have an idea. Allow Ulloa to enter the US Consulate, tell him that only one migrant may enter the United States, himself. In fact, “may” is the wrong word. Tell him that he is “required” to enter the United States, arrest him on the spot, try him for the 1987 terrorist attack, and, if convicted, put him in a cage for the rest of his life. Members of the "caravan" led by a Honduran terrorist are demanding the US either give them $50,000 each to return home, or be allowed into the US. Allow Ulloa into the US Consulate in Tijuana, then arrest him and bring him to the US for trial.